AirPower A2001 blower, powered by either one- or three-phase electric motor, generates the vacuum required for removing the particles loosened by AirPower brushing device and transfers them to the AirPower S2001 filter unit. The power ratio of the 1,5 kW motor of AirPower A2001/220V makes a start up without an overload of the electric net possible. In the more effective AirPower A2001/380V an overload is prevented by a phased start up and stop. Additionally, a possible wrong rotation direction is easily changed with the phase switch on the mains plug. The operation range of AirPower A2001 / 220 V with a flow velocity of 16 m/s in a Ø 200 mm duct is up to 85 m. With the more effective AirPower A2001 / 380 V the operation range is extended up to 220 m in a Ø 315 mm duct with the same flow velocity. 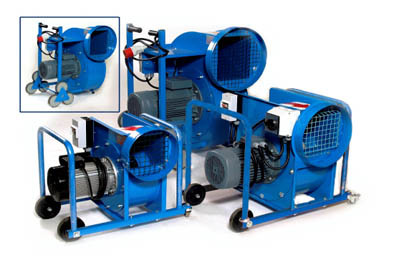 If a wider operation range is required, two or more vacuum makers can be installed parallel with each other. AirPower hose package makes an easy connection of AirPower A2001 to standard size air ducts and AirPower S2001 filter unit possible. 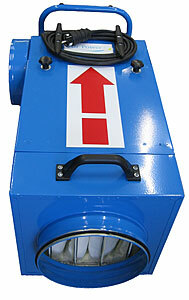 The package includes Ø 250 mm and Ø 300 mm hoses and adapters. AirPower A2001 fulfills the CE requirements for the European Community area, and is thus suitable for safe usage in all operation environments from small houses up to requiring hospitals.